I love Bandra. There is no doubt about that. 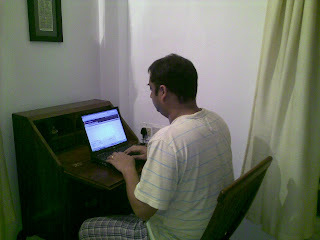 But the flip side of being a Bandra blogger is that you tend to blog from a very small house. You are lucky if you can fit in a toothbrush mug. A writing table is a luxury which the odd Bollywood star can afford. And some of them do blog nowadays. So I spent a couple of years hunched over the sofa or the rocking chair or the lounge chair or the folding chair blogging away industriously. And periodically taking breaks when my back gave in. The house we rented sometime back gives us the space to think of a writing table after putting in the toothbrush mug. But getting a writing table is easier said than done. The usually reliable Fabindia let us down. The shopping mall Home Stores weren't of much use. We even checked Ikea at Dubai to no avail. At one point we contemplated buying a dining table (no we don't have one!!!!) and multi tasking. 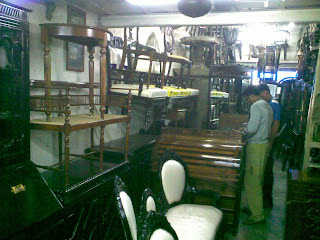 That's when we set off in search of the legendary Oshiwara furniture market. We manged to spot it (S V Road Oshiwara) last Saturday and checked a few shops. It was hot, dusty and one felt claustrophobic in the narrow shops. Still there was a glimmer of hope. There were a few workable options. Went there again today. After hauling our selves out of bed at noon. Drove the empty, glaring roads. Looked at a couple of shops. Saw some nice and simple pieces. Began to move towards the shop we zeroed in last time. Suddenly K walked into a shop with no sign. The furniture and the seller looked slightly more classy here. And there it was. K spotted it. Nestled in a corner. Elegant, aristocratic, genteel and yet compact, Bombaiya style. 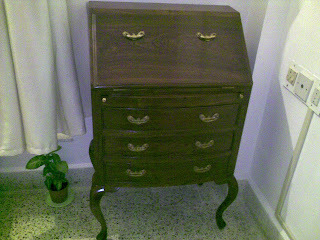 A chest of drawers which open onto a writing desk. Fell in love with it immediately. Like with a girl in checked pyjamas eons back. Selected a chair for the table. Haggled. Two and a half thousand Rupees down on the quoted price. And finally I have a writing table. And the actual chair will come on Saturday. Our study room is no longer a place to dump clothes for ironing. What? You want a food angle? Well the best thing about furniture shopping at Oshiwara is stopping at Calcutta Club. Our fruitful shopping today was followed by a celebratory meal of chholar daal, alu bhaja, rice, bhetki paturi and patishapta there. We had bought a number of sauce packets from Switzerland. The instructions were in a foreign language. I typed it in Google translate and tried Frech and German. Neither worked. So I followed a friend's advise, followed my guts and made a lovely penne in Sauce Bernaise (from a sachet) with chopped chicken franks. Which was cool because I hate following recipes. Don't mind dishing them though and in the middle of all of this helped a colleague make fish curry for the first time for her husband through Facebook and SMS instructions. Her husband later told me that the curry turned out very well. All in a day's work. Hi, I've been following your blog for a while now. Thought I would finally come out and say hello! That's a really nice study table. It would be great for writing the old-fashioned way as well, on a notepad or in a journal. I've been wanting to get one for years. I keep thinking I'll go to Chor Bazaar and look for one. Never been to Oshiwara and now you make it sound tempting. Very nice writing table... So lot more posts coming our way ? I liked cloudcutter's comment : women are really easy to shop for. As long as it's really big and really expensive and makes other women jealous! Thanks so much for writing in. the table's truly old fashioned, as many say I am, and compact too. looks straight out of a Ray film. Both my teachers and I had nightmares when I was in school over my handwriting so I for one don't mind trading the notepad for a keyboard :)I'll dig up the biz card and give you the number of the person I bought it from if you want. Somoo, many long posts indeed. Yes I usually take the easy waay out and head to a boutique. Most of my gift shopping is quite last minute. I have two days left and hope inspiration strikes me. actually I had one planned (wooden flooring which she likes)> But as K pointed out when i sugested it, doesn't make sense in a rented place. Which has been my stand so far. That would be great! Please email the number to me, whenever you have the time. No rush. Awesome lovely table.....a dream buy...congrats!!! pssst.....they work extremely well as bar counters for compact homes too!! That's a very good suggestion Pinku. I'll bounce it off her. Actually we are a slave of the past too. We had made a cane dresser done when we got married. 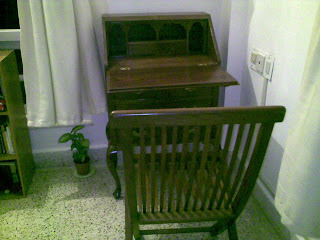 Swapped that recently for a cute but very compact telephone table from Fabindia which doubles as her dresser. We bought that keeping our old place in mind. Got more space now. And the creams and bottles keep falling off. Advanced wishes for the Anniv. Rhea, Sandeepa, Sharmila, the table's breathtaking. And as K said, it found me. It is so unbelievable. Sharmila, hate it when one writes something and then it goes into a black hole. Sharmila, I can completely empathise with that. I have had huge moment's of frustration when something i write disappears. oooh...how beaitiful !!!! wat was da original price quoted ?? do we hav to refurbish it ...after buying? Aditi...it was a while back. I think chair plus table came to about 10-12,000. We gaot about a thousand or two off. Gorgeous piece, love the Japanese art, culture, cuisine, the people, the country.